Colton Haaker (Husqvarna) successfully defended the SuperEnduro World Championship title he won for the first time last season after another final-round decider, this time in Albi, France. 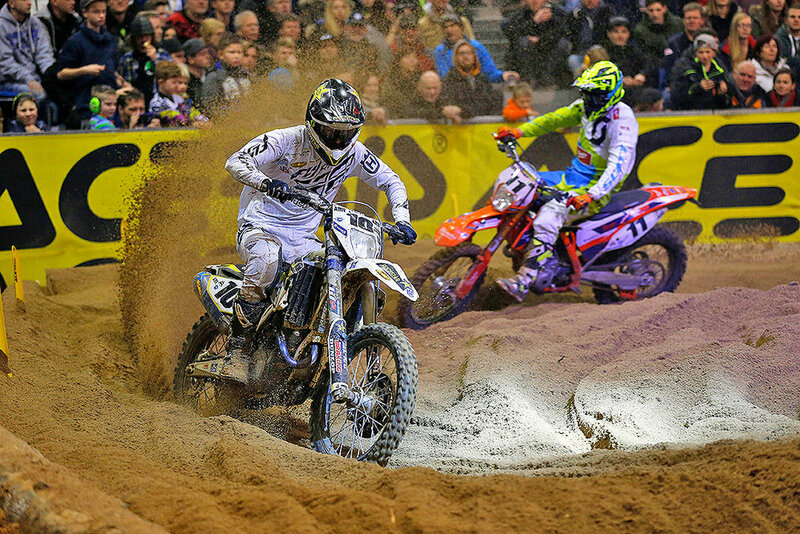 After placing a strong second overall at the opening round of the season in Poland, Haaker's defining moment of the campaign came at round two in Germany, where he enjoyed a perfect night with three final wins. Third place overall at round three in Spain meant that he arrived in France with an eleven-point cushion over his closest challenger Alfredo Gomez (KTM). Kicking things off in front of a capacity crowd at the Exhibition Centre of Albi it was Jonny Walker (KTM) who once again secured Superpole, and when the gate dropped in heat one the Brit secured a comfortable victory from Haaker and Gomez. The reversed start for heat two saw Gomez work his way to the front to take the win, but second place for Haaker meant he maintained a small points buffer entering the final heat. Gomez did all he could to keep his title hopes alive, the Spaniard charging to his second victory of the night to take the overall win, but as Walker cruised to second, Haaker happily crossed the line in third and claimed another FIM World Championship title to take back to the USA. Colton Haaker (Husqvarna) completed a perfect debut season in the FIM SuperEnduro World Championship at the final round of the series in Madrid, coming out on top of the three-way title showdown with fellow American Cody Webb (KTM) and Great Britain's Jonny Walker (KTM). The Rockstar Energy Husqvarna Factory Racing rider, whose father John Haaker was an ISDE Gold medallist, started the championship with a fourth overall in Poland but after that he never looked back, finishing on the podium at every round. The last event of the season in Las Rozas started with a third place for Haaker in the opening final, before finishing second to Webb in the second final. Despite a bad start in the decisive third final, Haaker battled back to the front and went head-to-head with Webb for the win, making a pass on his compatriot on the final lap to secure the title in dramatic fashion. Webb was forced to settle for the runner-up spot in the championship ahead of Walker in third.